We are experts in Wall Tie Survey & Repair. Cavity wall ties in your home are commonly made of metal coated in bitumen or zinc. They are used to hold together a cavity wall system of two separate walls introduced in the early 20th century that offered better protection from the elements as well as reduce the amount of heat lost from your property. However, it is when these cavity wall ties begin to fail that they can compromise the structural integrity of your property, and if left for a long period of time, can lead to very costly structural repairs for you. Wall ties are an essential element in the stability of masonry panels. Prior to 1978, wall ties were usually manufactured from galvanised mild steel. These were common well into the post war years; right up until the early eighties the defective cavity wall ties were still being incorporated into new houses. The many, many new houses built through the 1970’s and beyond contained wall ties which were manufactured to a lower standard than was adopted later. At the time these ties were expected to last the lifetime of the building, but for many years it has been recognised that some of these wall ties have corroded after only 15 or 20 years. When these ties corrode, they can expand to seven times their original thickness. 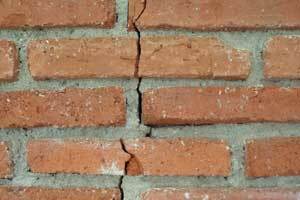 This causes the brickwork to crack at the mortar joints and can result in major damage and sometimes the collapse of your walls. Many buildings that were built using cavity wall construction are now suffering from deterioration of the metal wall ties that should brace the inner and outer leaves of their walls. The number of distressed cavity wall ties could affect all properties built prior to 1981. Signs that your home may be suffering from broken wall ties include stepped or horizontal cracking and the bulging of walls. This can result in a weakening of the structure that can be detected by surveyors and often seen to cause a problem when seeking a mortgage for the purchase of a property. Do I need a Wall Tie Survey & Repair? What this means is that if you are buying a post war house built before 1983 should have a wall tie survey carried out. A survey will identify any corrosion issues before the problem becomes dangerous or expensive to repair. Generally, where thin section wire ties are installed the repair is one of installing new stainless steel ties, without the need to remove or structurally isolate the rusting items. They can be left to rust away, with the new stainless steel wall ties ties taking the strain. Virtually all catastrophic failures we get called to these days involve post war property with wire ties present. Significant corrosion in pre-war housing, approaching wall tie failure is almost always preceded by horizontal cracking in the outer leaf – something which thankfully serves as a warning in most cases. Wall tie surveys are available across Cheshire via our survey team – call 0800 0988 277 for further details or use our contact form opposite. Our surveyors are experts in identifying distressed cavity wall ties and providing the best solution while ensuring that all work is of the highest standard and meets all of your requirements. Signs of broken wall ties include stepped or horizontal cracking and the bulging of walls. This can result in a weakening of the structure that can be detected by surveyors and often seen to cause a problem when seeking a mortgage for the purchase of a property.